Atlas Hour is a collection of poem-maps whose cosmology embraces the works and lives of the painters Vermeer and Mark Rothko, Fra Angelico and Gerhard Richter, the anonymous child-artists of the Nazis’ Terezin transit camp and the poet’s own children. Sifting and selecting moments in history and in the annals of art, these poems bring the stuff of everyday into relationship with the great mysteries of existence: what we believe, who we love, whom and what we choose to hurt or leave unharmed. Carol Ann Davis’s Atlas Hour is formally inventive, visually striking, and fiercely intelligent. But it’s so much more than that, too: a thoughtful meditation on how family, history, and aesthetic beauty might help us understand our position in a complicated world filled with moments of joy, misgiving, and suffering. The minds at work in these finely wrought poems are at once intricate and expansive, reaching finally through art toward the unknowable and divine. This is an ambitious and riveting collection. In Atlas Hour, Carol Ann Davis works her material with a jeweler’s steady hand, honoring the sensuous definition of surfaces as well as the more elusive claims of desire, sorrow and the gratitude of living. When outer and inner are drawn into balance—and they are, in poem after poem—there comes a catch in the breath, the sense of a rightness apprehended. What we admire in Carol Ann Davis’s new collection is akin to what we admire in Dickinson—a quality of ardor as the poet struggles toward grace, a grace that is sought in both the domestic and in the ineffable. We are thus offered deeply acute poems about the experience of motherhood as well as searching poems of ekphrasis. Again and again, Davis goes in search of the transcendent moment, of those times of ‘belief and unbelief changing places.’ Atlas Hour is a resonant and haunting collection by a poet of the first order. use this, your inside voice. What did your father say? Quiet as a church mouse. What did my mother? Carol Ann Davis’s first collection Psalm appeared from Tupelo Press in 2007, the same year she was awarded a fellowship in poetry from the National Endowment for the Arts; Atlas Hour followed in 2011. A former longtime editor of the journal Crazyhorse, her work has appeared in The American Poetry Review, Agni, The Threepenny Review, and Volt. 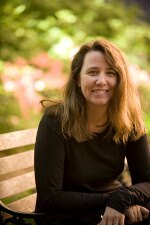 In 2015, an essay she published in The Georgia Review was named a finalist for a National Magazine Award in the Essays and Criticism Category. She lives in Sandy Hook, CT, with her husband and two sons, and serves on the faculty at Fairfield University, where she teaches in the Fairfield University Low-Residency MFA Program. This triangular figure — a body or shape, a lens or opening, and the ineffable — informs every startling poem in Atlas Hour, whether its subject is a painting, a domestic scenario, or a motion of atonement, redemption, and forgiveness. Davis’s poems achieve radiant feeling by means of ekphrastic vision. The trigger, whatever tapestry, drawing, or painting she references, hardly matters. Instead, Davis foregrounds a tender, authentic intimacy shared by her speaker and listener. Davis maintains a deep engagement with, and investigation of, the world around her. She is able to immerse herself in the newness of things by seeing them through children’s eyes, and describes what she sees with a lovely freshness and excitement.